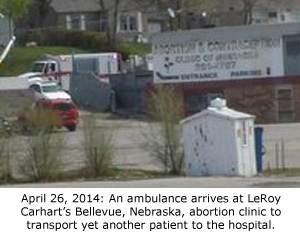 An ambulance arrived at LeRoy Carhart’s Abortion and Contraception Clinic of Nebraska in Bellevue on Saturday, March 26, 2014, and transported yet another a patient to a nearby hospital. This is the seventh known abortion-related medical emergency involving Carhart in the last two years. This even comes ironically on the same day that Operation Rescue received a letter from the Nebraska Department of Health and Human Services notifying it that there would be no investigation into other botched abortion incidents involving Carhart. According to pro-life activists who were at the clinic at the time of Saturday’s incident, the injured patient was a woman who had come to Carhart’s poorly-maintained abortion clinic the previous day on Friday with her teen-aged daughter. On Friday, the two women stayed at Carhart’s abortion office for about three hours, then left with the older woman driving. The following morning, the two women were seen returning to Carhart’s facility. At about 11:50 a.m. on Saturday, the ambulance arrived for the older woman. According to witnesses, the daughter ran out of the clinic and told pro-life activists, “That’s my mom,” referring to the woman who was being transported. 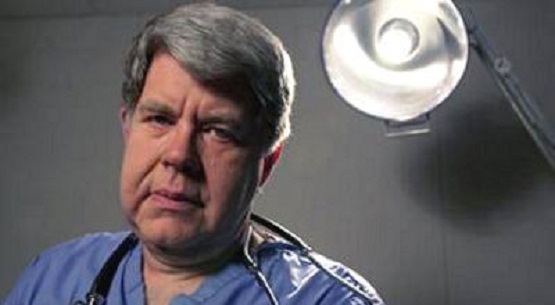 “The events reported by witnesses are indicative of a botched early second trimester abortion procedure,” said Newman. Carhart has carried no hospital privileges whatsoever since 1982. A lack of hospital privileges has been shown to interrupt the continuity of patient care and create delays in emergency treatment of women suffering life-threatening abortion complications. In addition, Carhart was involved in the 2005 abortion death of 19-year old Christin Gilbert, who died of complications to a third trimester abortion at a now-closed late-term abortion clinic in Wichita, Kansas.